know which one contains which URI, the tool can also open existing files. For a broader acceptance I think there is now way besides HTML <keygen>. Everything else we have now is to complicated for most people. soon or later. Let's the how this API will look like. > the PKCS#12 output, rather than use keygen? if so I like the design. > things consumers OUGHT to have. 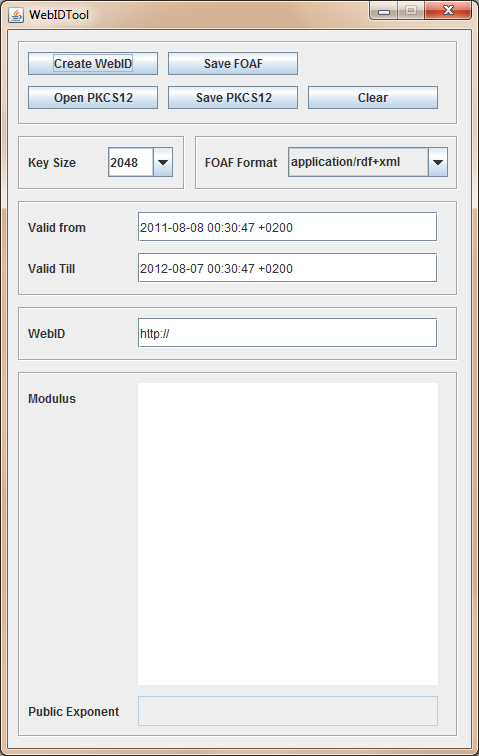 >> command line tool to generate WebID certificates and FOAF files. >> Last weekend I added a simple GUI. Next message: Henry Story: "new foafssl.org server"
In reply to: Peter Williams: "RE: [foaf-protocols] WebID Tool"
Next in thread: Peter Williams: "RE: [foaf-protocols] WebID Tool"
Reply: Peter Williams: "RE: [foaf-protocols] WebID Tool"
Reply: Henry Story: "foaf=workshop was: WebID Tool"